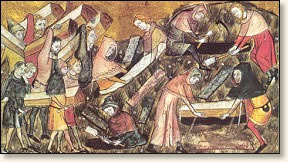 Coming out of the East, the Black Death reached the shores of Italy in the spring of 1348 unleashing a rampage of death across Europe unprecedented in recorded history. 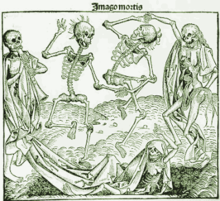 By the time the epidemic played itself out three years later, anywhere between 25% and 50% of Europe's population had fallen victim to the pestilence. The plague presented itself in three interrelated forms. The bubonic variant (the most common) derives its name from the swellings or buboes that appeared on a victim's neck, armpits or groin. These tumors could range in size from that of an egg to that of an apple. Although some survived painful ordeal, the manifestation of these lesions usually signaled the victim had a life expectancy of up to a week. 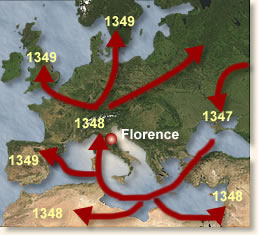 The first recorded appearance of the plague in Europe was at Messina, Sicily in October of 1347. It arrived on trading ships that very likely came from the Black Sea, past Constantinople and through the Mediterranean. This was a fairly standard trade route that brought to European customers such items as silks and porcelain, which were carried overland to the Black Sea from as far away as China. As soon as the citizens of Messina realized what horrible sickness had come aboard these ships, they expelled them from the port -- but it was too late. Plague quickly raged through the city, and panicking victims fled, thus spreading it to the surrounding countryside. The main causes of the devastating Black Death in Europe were actually fleas that were the carriers of the bubonic plague, which was spread by the black rats that they lived upon. Had the fleas and the black rats carrying them had not reached Europe then the Black Death would not have happened. These fleas and black rats were not naturally found in Europe during the 13th century, yet they had already spread the Black Death through large areas of Asia. The fleas carrying the bubonic plague and inadvertently moved by invested black rats would have taken a much longer period to reach Europe itself via land from Asia. 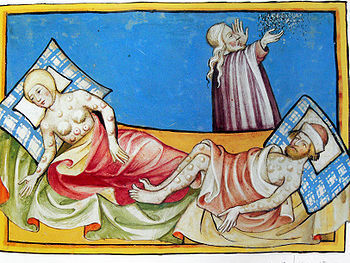 The Black Death was one of the deadliest pandemics in human history, peaking in Europe between 1348 and 1350. It is widely thought to have been an outbreak of bubonic plague caused by the bacterium Yersinia pestis, but this view has recently been challenged. Usually thought to have started in Central Asia, it had reached the Crimea by 1346. From there, probably carried by fleas residing on the black rats that were regular passengers on merchant ships, it spread throughout the Mediterranean and Europe. First sign of the black death appears in Europe inMissina, Sicily arriving from trading shipe from the black sea.